I have been looking for some distro to recommend to newbies. Zorin 8 was to buggy, but Zorin has a concept that is perfect for Windows people jumping over to Linux so I decided to give Zorin 9 a spin. 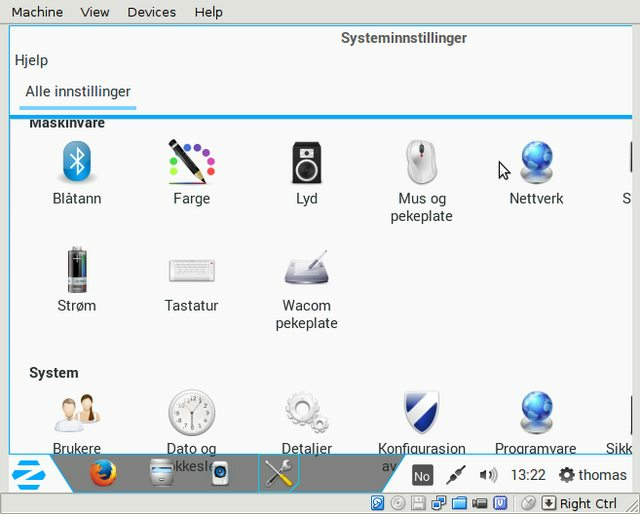 Zorin has made a noticeable climb on Distrowatch so it must have improoved. 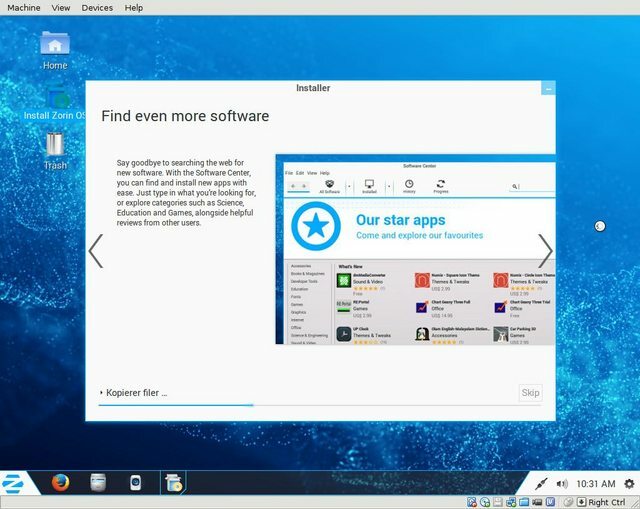 Zorin is based on Mint so it will be no rolling release, but it will have Windows 7 look and feel out of the box. It is a 1,4 giga download for the 64 bit version. I started the live CD. No problems there so I picked the "install" option on the desktop. Here I could choose to use the entire disk and encrypt it and use LVM. I went for the regular install using the entire disk - without any encryption. The installation recognized my locale and started the install with some nice music and a slideshow. The slideshow is quite informative and nicely put together. While I am waiting for it to download the latest files I might add that this is yet another Ubuntu based distro (Like Mint) so all the Ubuntu /and Mint) documentation should apply. With these kinds of distros it is always a concern in which direction Canonical wants to jump - since they have a history of reinventing the wheel after a "not invented here" policy. This may affect the forks too. So time to boot it up then and that works just fine and I am nicely logged in. There is the problem that I have a resolution of 800x600 in my VB so i cannot even get to the screen section in the settings. So I had to edit /etc/default/grub and set a resolution of 1024x768 there to have something to work with. This does not work from the desktop because you need to be root. 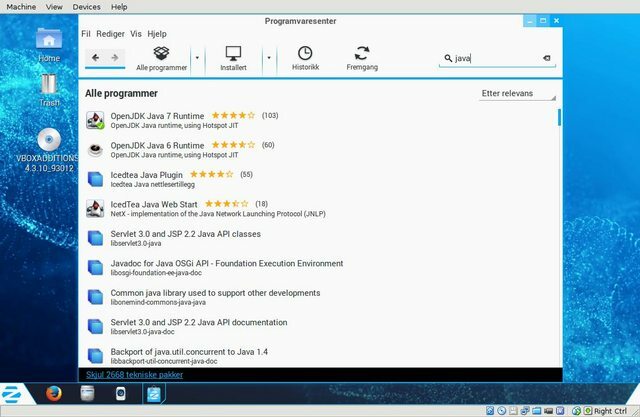 So the installation went fine and the resolution problems in VB will only be for newbies - and they will probably have a nice exe to install directly from the Windows desktop (not the Linux root challenge). Zorin with the Win7 look makes a nice impression and has some nice menu animations. It is the Cinnamon desktop. In Firefox flash works out of the box but not Java. This might be a problem for a newbie who wants to use his new Linux for banking.. I picked the IcedTea javaplugin and that toke care of that. It is nice -nuff said. This lets you pick the Windows 7 look (default) or the XP look or Gnome2. Now Grumpy old Linuxers hold these functions for utter unnecessary - and will probably make their voices heard. But for a newbie this is a nice touch to make it look familiar to simply skip the learning curve. Both the Theme changer and the look changer change the look and feel "on the fly" - it changes instantly. Personally I prefer the Win 7 look even if it is a bit hard to see the search field at the bottom of the menu. 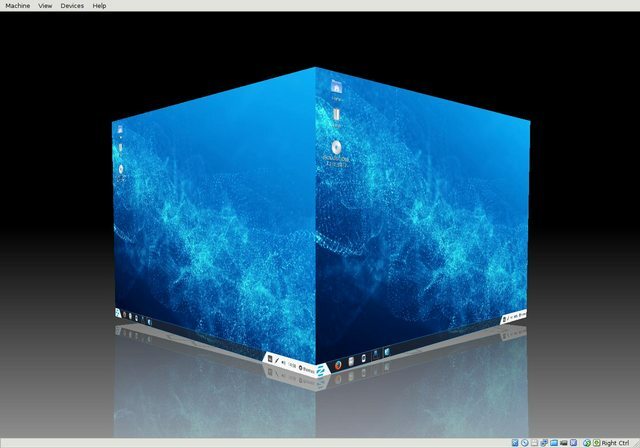 Compiz is active and pre-configured and it will impress people coming from Windows. It is nicely done without overdoing it. Play on Linux and Wine do come with Zorin 9 so you can install Microsoft Office or Adobe Photoshop or even play Microsoft's Age of Empires. There is no need to install MS office packages though because everyone will feel right at home with a nicely integrated Libreoffice. So far I think it is safe to say that Zorin 9 has become a newbie friendly distro and this does explain the rise on Distrowatch. I updated today after a long time and all went fine. Zoring 10 is out but the only way to upgrade from 9 to 10 is to download and install the iso. apt-get dist-upgrade does not upgrade to a new version it only takes care of dependencies in the already installed version. That is why I prefer rolling releases; and upgrading like that is definitely not newbie friendly. Taking backup and install Zorin, deleting some partitions and make your old data work again. I like it even still! Nice video too btw. Knowing me I'd take the Gnome 2 desktop, but for newbies the others are good. 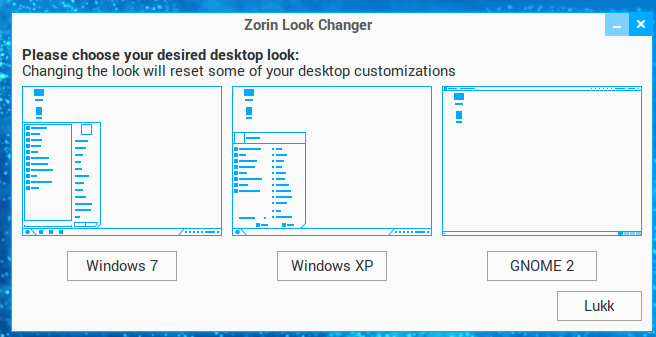 Yup Zorin does give you those choices and leaving it alone for "ages" and then update without a problem is a good thing too. Tried another update on this old install again today. That did not go well and the repos could not be found anymore. I guess that is the drawback of not having a rolling system. Now Zorin has to be installed again and the data must be copied over after that.